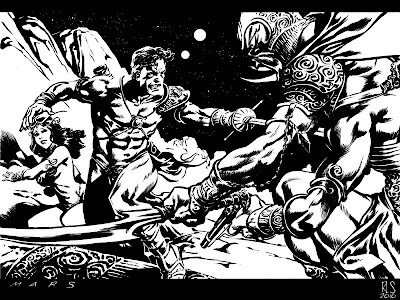 John Carter and the other Edgar Rice Burroughs heroes were big parts of my childhood. Burroughs was an incredibly prolific writer and, in my opinion, there was no better writer at writing adventure novels and stories. So what if his stories were, by and large, factually inaccurate? He had a sense of action and drama that were second to none. I probably would have picked John Carter for my topic if no one had when my turn came so I'm really glad Andy picked him. Thanks Andy! I think I might be your biggest fan, Ron. Thanks Mitch. Hope you still like it when it's all finished. I can't wait to see this when its finished. Great pose (with the tilt of the hips and shoulders) you can really feel his weight. Plus the line quality is really emotive. I hope you scan and post the finished version high res. This is going to be massive. Beautiful rendering. Dude, this is classic!! Looks amazing! OK, I've updated the piece. Hope you like it! Rojo, I'm afraid Comic Twart is on an invite-only basis. Glad you like the blog and thanks for commenting! A total stunner, Ron - so much love in this one. Great texture and details - love the filigree on the armour and the fallen pillar. One of the best ever TWARTS, I'd say. it reminds me of the dave cockrum issues of the marvel book. Well thanks guys. Glad you like it.